Augusta Dabney is best known for her roles in day time TV as well as appearing in several TV anthology programs. Augusta Keith Dabney (October 23, 1918 – February 4, 2008) was an American actress known for her roles on many soap operas, most notably as the wealthy but kindly matriarch Isabelle Alden on the daytime series Loving. She played the role from 1983 to 1987, from 1988–91, and again from 1994–95, returning to the part after Celeste Holm and Patricia Barry played the role but did not stay with the part for various reasons. She appeared in numerous episodes of such anthology drama series as Studio One, Kraft Television Theatre, and Robert Montgomery Presents. 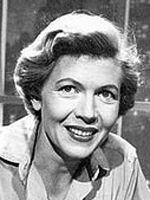 She also had roles on numerous other daytime soaps, including Young Dr. Malone as leading character Tracey Malone, Another World, As the World Turns in two different roles, Love is a Many-Splendored Thing, Guiding Light as the original Barbara Norris (1970), A World Apart as leading character Betty Kahlman Barry (1970-1971), General Hospital as Lee Baldwin's second wife, Caroline Chandler (1975-1976), One Life to Live as Pat Kendall's mother, Helena Ashley (1979) and The Doctors as Theodora Van Allen (1980-1981).